No nation is an island, and Maltese nationals are European citizens. Malta should, consequently, actively contribute to European efforts which seek to propagate peace and stability, especially in Africa, rather than wait for troubles to reach our shores. Malta has earned the reputation of being a neutral and unbiased broker so its active role in pursuing peace and security is encouraged and should be exploited. This does not impinge on Malta’s Constitution, which promotes the active pursuit of peace and security. Nonetheless, the question is to what extent this foreign cooperation should be taken. The matter is certainly one of a political nature, which governments of the day have interpreted differently. Upon joining the European Union (EU) in 2004, Malta became party to the EU’s Common Security and Defence Policy (CSDP), a framework through which Malta could participate in humanitarian and peace-keeping efforts at the international level, under the EU banner. Now, unlike most of the EU’s decision-making policies, matters concerning the CSDP must be agreed by unanimity, meaning that all Member States must concur to any EU military intervention, or at least not object. Member States are also free to decide how and whether they will participate in specific EU military operations once launched, so there is quite a bit of flexibility in terms of participation (capabilities, duration, numbers). The above implies that Malta is not obliged to contribute forces to EU military operations. It can also actively use its neutrality to block any EU action if this is deemed to be in contravention of international law, even if Malta has no intention of participating in the action. Now, while the character of crisis management operations differ from one international organisation to another, a common factor is that none of the organisations own any deployable forces, so all are dependent on force contributions from Member States or allies. Moreover, each organisation offers its own specificities, and Malta is free to choose which organisation it contributes capabilities to, if any at all. (1) United Nations (UN) opera­tions tend to be cumbersome and take a while to get off the ground as forces could originate from any of the 193 member States, which all have different operating procedures, while the UN’s Security Council is com­posed of 15 countries, including Russia and China. (2) EU operations generally deal with situations that require military interventions of a softer nature given the membership of six EU neutral countries. They generally have more teeth than UN operations, and are able to swiftly deploy, as the 28 contributing countries employ similar doctrines. (3) NATO conversely caters for the higher end of the spectrum, with the defence alliance preparing itself to fight wars, and the United States being the dominant member. Malta, though not part of the Alliance, could participate in NATO operations through its membership in the Partnership for Peace programme, though it has never chosen to do so. It should, however, seriously consider signing up to NATO’s Mediterranean Dialogue given its respect from both north and south. 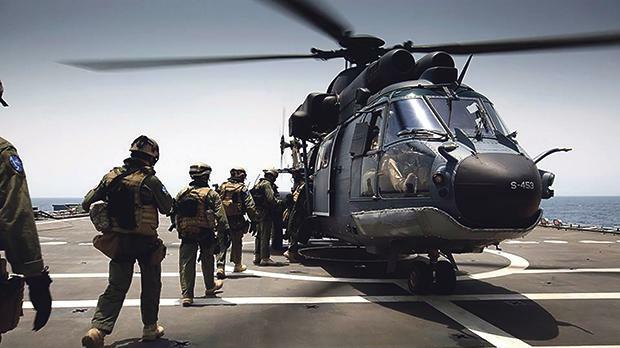 (1) Since Malta was charting new waters, the AFM first de­ployed several officers to the EU Monitoring Mission Georgia after the Russian invasion of this country in 2008. (2) Then, the rise of piracy around the Horn of Africa endangered Maltese merchant vessels navigating between Asia and the Suez and vice-versa, so a decision was taken to deploy an armed AFM team to support the EUNAVFOR Atalanta counter-piracy operation. The Maltese contingent was tasked to protect UN World Food Programme shipping steaming to Mogadishu with food aid, under the watchful eye of Dutch frigates. The AFM also began a standing contribution of a staff officer to the counter-piracy operation headquarters in London. (3) As Somalia was a failed State, the EU deemed that the only way to bring this country back on its feet, and eradicate piracy in the process, was by building the Somali Armed Forces. Since this training was deemed to be too dangerous in Somalia, the EU reached an agreement to conduct this training in Uganda in 2009. Malta decided to contribute to the EU Training Mission Somalia with infantry instructors since our country was receiving thousands of refugees from Somalia. (4) Then, once the NATO campaign in Libya of 2011 ended, the EU was determined to support Libya and build its border control services, so the EU established the EU Border Assistance Mission Libya, where the AFM once again contributed with staff officers. (5) Uncontrolled migration out of Libya, and the Lampedusa migrant boat calamity of 2013, saw the EU then launching its Central Mediterranean Naval Operation Sophia, where the AFM contributed to the operation with a staff officer to the Rome-based headquarters. Si vis pacem, para bellum. The Latin adage, translated as “If you strive for peace, prepare for war”, is the basis for all military doctrine. Military effectiveness and efficiency can only accomplished by conducting exercises, ideally through interface with other militaries, and even by deploying. The alternative is to avoid any form of military en­gagement with partners in order to give the perception that Malta is surgically neutral, but this does not necessarily mean immune to coercive actions. The reason why I raise this discussion is because Europe is reali­sing that it cannot be de­pendent on the United States for its protection eternally, so the EU is seeking ways to intensify military cooperation, one way being through Article 46 of the EU Treaty on Permanent Structured Cooperation (PESCO). This article encourages groups of like-minded States to deepen military cooperation in the areas of training and exercises, capability building and operational domains. All EU Member States have joined the programmes, including five neutral countries, except the United Kingdom given Brexit, Denmark given a peculiar political situation, and Malta, which opted to take a ‘wait and see’ approach. If it does not pursue PESCO, Malta stands to lose out on some significant opportunities, including harbour protection, mari­time surveillance, cyber security and disaster relief, which are all very relevant to Malta’s security. Moreover, many major EU countries, including France and Germany, are pushing for common defence (EU Treaty Article 42/2), the precise meaning there­of remaining unclear as yet. What is for certain though is that any development cannot infringe on national constitutions, and unanimity is obligatory. This being the case, it is best if Malta plays an active role in defining this concept rather than waiting for the inevitable, when Malta will be pushed into a corner. Since European defence is here and now, and many of today’s threats know no borders, Malta’s security should be of prime concern. So it would be wise to discuss European defence in Parliament and have a mature ex­change of thoughts that could lead to a revised policy. This is in line with Malta’s Constitution, and the EU is not a military alliance but a political union. In this regard, Malta should refrain from following archaic policies that threaten the island’s existence but move on to policies which ensure our security, especially now that Malta’s thriving economy is going to make Malta more sensitive to changes in the geopolitical dimension. Lt Col (Ret’d) Martin Cauchi Inglott is a retired senior Armed Forces of Malta officer who served as Commander of the AFM’s Maritime Squadron, FRONTEX Mission Commander and board member, and colonel with the EU military staff in Brussels. He is now a consultant with the United Nations and secretary general of Partit Demokratiku.